Have you ever seen a tree bleed? Not figuratively. Literally. 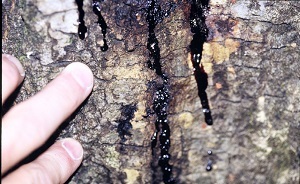 Have you ever seen a tree exude a red viscous liquid in quantities enough to run down the trunk in long, sticky streaks? I have. Enter Phytophthora ramorum, the fungus like pathogen responsible for Sudden Oak Death. The official origin of the pathogen is still up for debate, as are many aspects of its lifecycle, but the leading theory is that it arrived in the Bay Area of California on infected rhododendrons. The disease causes high instances of mortality in oaks, especially coast live oak, and tanoaks, trees which play a large role in the grassland ecosystems surrounding San Francisco. Since its entry into the US in the 80’s, much work has been done to understand the spread and epidemiology of the disease. Forest pathologists from around thecountry, including researchers here at Ohio State Plant Pathology, have put their heads together in an effort to stop the spread of the disease, still, much remains unknown. 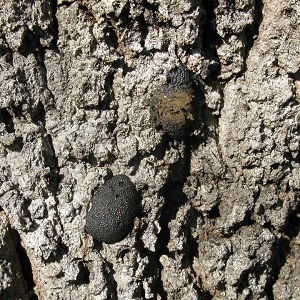 Sudden Oak Death is a rather complex system that involves a fungal-like organism (oomycete) ramorum, several species of bark and ambrosia beetles, and a decay fungus, Hypoxylon atropunctatum. Bay laurel, a common tree often interspersed with coast live oaks, plays host to ramorum, where it causes little more than leaf blight. Trees can enter remission once infected, though the mechanisms behind it have yet to be explained. P. ramorum is an oomycete and requires two separate mating types to reproduce sexually – this has not been observed in a field setting. It is important to be diligent when it comes to invasive diseases and pests, as prevention is the best method for controlling the spread of diseases and insects. Quarantines should be followed, hikers should stay on trails and check boots for caked on dirt, and clothing for plant matter or burs, and wood and other tree products should not be moved. 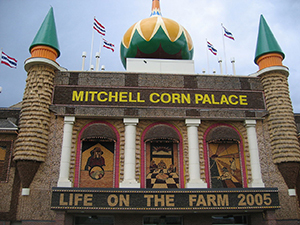 You grew up in the heartland, drove the country roads, and saw it everywhere; it has been called “King Corn”. The North American crop Zea mays, has a long history in what is now the United States and Mexico. From a wild species now extinct, Zea mays has been selectively bred and domesticated for several thousand years. In older times, and still in other English-speaking countries, “corn” is a general term used to describe many local cereal crops, not just the long-eared, American native species. But this in of itself shows the prowess of the crop in our land. Another sign of prominence is the fact that the USDA has declared corn a “native species” by introduction, in the lower 48 states, along with the fact that a whole region of the country, “The Corn Belt” has the crop as a namesake. Corn has become a huge replacement for sugar, in the form of fructose. Corn is in our fuel. It feeds animals, and it feeds people. However, some say corn is overprotected, an inefficient use of farm bill subsidies. Nevertheless, while production in the United States has remained high, another country has adapted to growing much of our beloved field crop as well, namely China. As worldwide populations demand more meat, it is probable that corn production will rise as well. I grew up on the shores of Lake Erie. As a kid my friends and I would spend our summer days at the lake fishing, swimming, jet skiing, and getting into all sorts of other shenanigans. I no longer live by the lake, but I still hold the same childhood love for the water and all the recreation and adventures that it offers. I’m sure anyone else who has grown up by the lake, or any water source, share the exact sentiments that I do. That’s why I’d like to inform the public of an increasing threat to the Great Lakes basin, the Asian carp. The Asian carp were originally introduced in the 1970s in aquaculture ponds in the south as a biological control. However, due to subsequent flooding and human activity, the Asian carp escaped into the Mississippi River and are now swimming their way into the Great Lakes. The American Sportfishing Association is very concerned. The Asian carp have no natural predators and eat the base of the food chain. They are voracious eaters and prolific breeders, so it does not take long for these carp to reach the top of the food chain in their respective habitats. Along the Mississippi, we’ve already seen many prized fisheries displaced with decline of walleye and rainbow trout in waters where the Asian carp have taken over. There has also been a strong correlation of algal blooms in waters where the carp are present too. These carp are a major nuisance. Specifically, the Silver Carp, dubbed the “flying fish”, can jump out of the water, hitting and disturbing boaters and fisherman. If this invasion is not contained, water recreation on the lakes, a 7-billion-dollar industry, may take a massive hit in the future. John Zagar is a student at The Ohio State University studying to earn a Sustainable Plant Systems Major with a specialization in Turfgrass. Along with his love for water sports, John is also a big food guy (especially fish), and would like to let you know that Asian carp is very low on the list of tasty freshwater fish. Everyone has heard the phrase “How are we going to feed the world in 2050?” In 2050 it is estimated the world will just be over 9 billion people. Well we already can feed the world in 2050 with today’s yields. If you look at the world as a whole and all the food that humans produce we can feed everyone now, and in the future. Some scientist say for us to feed the world beyond 2050 a second Green Revolution is needed. So if farmers all over the world are growing and harvesting enough food then why in 2014-2016 was there 795 million people suffering from malnutrition? The major problems are the food people eat and the lack of income to a family. People all over the world are lacking in Iron, Vitamin A, and Iodine mainly because the food they are eating does not contain enough micronutrients to live off of. The main reason is income of the family. No farmer, seller, or country will give away food to a starving nation unless they get money from it. In conclusion there is enough food to feed the world the problem is getting all the food that is needed to the places that need it. Also if other countries can improve their income they would be able to buy more food to help boost their economy.